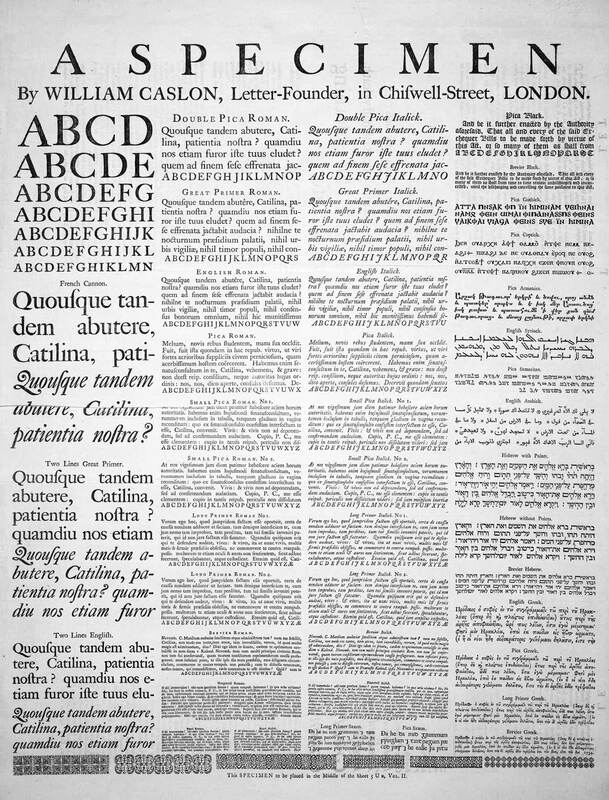 Spec­i­men of fonts of­fered by William Caslon, 1728. Yes and no. Sure, fonts are an im­por­tant part of ty­pog­ra­phy. But there’s much more to ty­pog­ra­phy than fonts. Sim­i­larly, there’s more to text for­mat­ting than what font to use. Text for­mat­ting in­cludes every­thing that af­fects the ap­pear­ance of the char­ac­ters on the page—not only fonts, but also point size, bold or italic styles, small caps, let­terspac­ing, and kern­ing. In this chap­ter, there aren’t as many bright lines be­tween cor­rect and in­cor­rect habits as in the last chap­ter. You won’t be able to get by on rote ap­pli­ca­tion of rules. You’ll need to start mak­ing ty­po­graphic judg­ments of your own.